What Is Jewish Book Month? Jewish Book Month is an annual celebration of books of Judaic interest and culture promoted by the Jewish Book Council. It takes place in the month preceding Hanukkah each year and has long been an important part of the book publishing annual calendar. Jewish Book Month is great for promoting books by Jewish authors or books that have cultural significance to the community. Book marketing and publicity staffs earmark appropriate books, which don't have to be "religious," per se — they include fiction or non-fiction in a huge range of topics — everything from history to contemporary Jewish life to Middle Eastern studies to books about the Chinese tile game mah-jongg (which was adopted by, and became a traditional pastime of, generations of Jewish women). Each participating community celebrates Jewish Book Month in their own way; often, the month is celebrated by local Jewish Community Centers or other organizations with Jewish Book Fairs or festivals. These may include writer interviews and lectures, author readings and signings, book sales, panel discussions and storytelling for children. When Does Jewish Book Month Take Place? Jewish Book Month takes place the month before the holiday Hanukkah, which is scheduled according to the Jewish calendar. Therefore, the exact date of Jewish Book Month celebration changes from year to year. For example, the 2018 Jewish Book Month dates were November 2-December 2, as Hanukkah started at sundown on December 2. Jewish Book Month began as Jewish Book Week in Boston, Massachusetts in 1925. 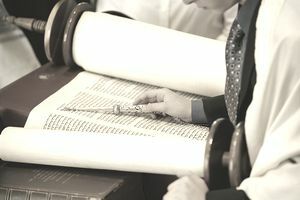 That year, Fanny Goldman, a librarian at the West End Branch of the Boston Public Library gathered books of Judaic interest and created an exhibit during the holiday of Shavuot. At the time, the West End of Boston had a large population of Eastern European Jewish immigrants, and so the books displayed were primarily in Yiddish and Hebrew. Shavuot (also called Lag B'Omer) commemorates the day God presented the Torah (the Jewish holy text) to the Jewish people and scholarship is also celebrated during the observation, so a book display was especially appropriate. Very quickly, the idea of Jewish Book Week spread to other libraries and communities and the National Committee for Jewish Book Week was founded in1940, chaired by Fanny Goldstein. That same year, in order to promote the giving of Jewish-themed books as gifts, the week was moved to precede the Hanukkah holiday. Owing to the popularity of the event, in 1943, Jewish Book Week was extended to become Jewish Book Month and the National Committee became the Jewish Book Council. To this day, the Jewish Book Council serves as a coordinating organization for Jewish Book Month, creating promotional and educational materials such as posters and bookmarks and suggested reading lists of books for the annual event. Acting as a clearinghouse for Jewish Book Month events is part of the Jewish Book Council's overall mission to promote the reading, writing, publishing and distribution of quality Jewish content books in English, as well as to serve as the coordinating body of Jewish literary activity in North America in both general and Jewish venues, advising local communities on exhibits, book fairs, book club appearances, author tours and other literary programs. JBC Network has about 100 member organizations including Jewish Community Centers, synagogues, Hillels, Jewish Federations and cultural centers that host book events. Each spring, the JBC sponsors a conference during which their member organizations can learn about upcoming books and authors of interest to their respective communities. In addition to promoting Jewish Book Month, the Jewish Book Council publishes Jewish Book World magazine and administers the National Jewish Book Awards and the lucrative Sami Rohr Prize for Jewish Literature.